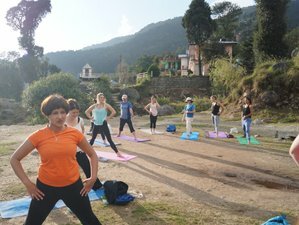 Yoga meditation teacher training course in Bhagshu, Dharamsala is a unique mix of yoga and meditation. The 200-hour yoga teacher training course is covering Hatha yoga, Ashtanga yoga with various guided meditation techniques. It is an international certification course, helping you to become a Yoga Alliance USA registered yoga meditation teacher. During the retreat you will be staying in Dharamshala. The accommodation is fully furnished private room with private bathroom and shower. The program is designed to cover traditional Hatha yoga, Ashtanga yoga, eastern and western philosophies and various meditation techniques. It is open to all individuals - beginners to intermediate practitioners. It is a highly recommended training course for yoga teachers, massage therapists, healers, Reiki practitioners and people who wish to have a career and serve the wellness community. As part of the curriculum, you will cover approximately 50 basic to intermediate yogic asanas and 10 to 15 global guided meditation techniques. If you are a yoga and meditation beginner and looking to deepen your self-practice or wishes to become a beginner yoga and meditation teacher. The 25 days yoga and meditation training is the right match. This course includes basic yoga asana, Hatha and Raja yoga, Kriya, Pranayama and meditation techniques. This is an International certification course, helping you to become a Yoga Alliance USA registered yoga meditation teacher. Mantra Yoga & Meditation School RYS 200 is offering you the opportunity to become a multi-style yoga meditation teacher through our 25-day residential yoga meditation multi-style certification course. Awakening spontaneous creativity, you’ll discover why untapped creativity is so important. The difference between spontaneous insight, understanding, and how meditation can take you beyond the story into pure imagination. It will awaken creative potential, and the increased ability to imagine new possibilities to become a guide, teacher and be connected with the wellness world which is so needed for the world today. What meditation allows - beyond inner freedom - the roles the mind and self-play in our created experience of reality, as well as the bigger, inspiring culturally transformative context for meditating. The essence of yoga, gist of Vedas and practices of Lambika yoga, Japa yoga, Aspasrsh yoga with divinity. Free time after lunch. No classes or dinner. Note that Sundays are free days and that no meals are provided on Saturdays and Sundays. You will go on daily walks and sunday excursions while in the program. Sarvottam is a yogi and meditation master who founded Rishikesh Vinyasa Yoga School to pass his knowledge on to others. He is the senior director of marketing and a spiritual meditation instructor at the school and is also a founding member of Meditation School Rishikesh - Shree Mahesh Heritage. His keen desire for intuitive knowledge drew him towards yoga and meditation. After continuously experiencing and sharing his yogic knowledge of the wellness world, he began teaching in 2014 and continues to share his knowledge with disciples worldwide. Born and raised in Rishikesh, Yashpal began his yoga studies in 2011. Through much hard work and dedication, he has become a master of Ashtanga yoga. His gentle, caring nature, and down to earth personality make his students feel at home in his class. Yashpal credits his practice of yoga for each and every blessing in his life, whether it be material or spiritual. His knowledge of yoga and ability to perform asana is truly inspiring. Yashpal holds a master's degree in yoga from Uttrakhand Sanskrit University. Born and raised in Rishikesh, Rajesh began his study of yoga in 2011 and has since become a master of Vinyasa Flow. Rajesh holds a masters degree in yoga from Uttrakhand Sanskrit University and has completed 1000 hours of yoga teacher training. Having worked for a number of local schools over the years, he decided to be part of Mantra Yoga and Meditation school with the intention of creating a more intensive yoga teacher training courses. If you are looking for a yoga teacher who looks at you and tells you all about the muscular and skeletal issues you would have to meet Yogacharya Mahender Prasad. He comes from a very strict yogic background. Most of Mahendra's life has been spent with monks and yogis in the Himalayas and he has spent a great deal of his time practicing yoga at Mysore and Pune. His teaching style speaks for itself. As an owner and director of Vishuddhi Yoga Ashtanga Vinyasa School, he takes a thorough interest in the practice of his students making sure that they get to assimilate the maximum from the course. Akshay started practicing yoga at an early age. After graduating in Yogic Science & Sub-subject Commerce, Akshay begun his yogic journey in 2009 and sought out gurus and teachers throughout India. He studied yoga asana and philosophy with monks at different ashrams in the Himalayas, Bihar School of Yoga (Mungar), and Divine Life Society & Yog Vedanta School Rishikesh and with huge passion and ten years of self-practice and seven years of teaching experience makes him a strict teacher who pays a lot of emphasis on biomechanics of the body while performing an asana. Growing up in a traditional family from India, he was introduced to yoga in his early childhood. He completed his Yoga Alliance certified 500h Teacher Training with his Guru Mahindra Prasad in Dharamshala / India. Rakesh is specializing in the traditional Ashtanga method after K. Pattabhi Jois. Constantly developing his own practice as well as his teachings, he is regularly practicing at the KPJAYI in Mysore. He is also experienced in teaching Vinyasa, Hatha, and Yin Yoga. For him, the practice of physical asana means the practice of awareness. Dharamsala is a picturesque serene town situated in the Himalayas in north India located at a distance of 490 kilometers from New Delhi. It is well connected by roadways and airways with a number of overnight buses and over three flights from Delhi to Dharamsala every day. People from across the world visit Dharamsala to pay a visit at His Holiness Dalai Lama’s Himalayan monastery and do trekking in beautiful Dhauladhar mountains. Dharamsala is a strong spiritual center with the presence of four holy temples also known as Shaktipeeth, in a radius of 25 kilometers. Over past decade, Dharamsala has also emerged as a yoga destination that offers travelers world-class yoga and meditation practices. During the retreat you will be served with vegetarian breakfast, lunch, and dinner from Monday to Friday. Meals won't be provided on Saturdays and Sundays. Towels, clothes or toiletries like soap, shampoo, toilet papers, cloth and mat cleaning detergent etc. A reservation requires a deposit of 21% of the total price. Mantra Yoga & Meditation School offers 200 and 300-hour international certification yoga teacher training courses and retreats in India.